Formerly a 15th century mediaeval fishing village which has grown into a town. During the 18th century, the Ostend Company brought wealth to the town through trade with the Far East. Ostend is situated on the North Sea coast, approximately midway along the 40-mile Belgian coastline stretching from De Panne via Nieuwpoort  Westende - Middelkerke - Oostende - Den Haan - Blankenberge to Knokke. The Royal Villa (built in the reign of King Leopold I) has been transformed in to an hotel-restaurant. Nowadays the Royal Court only visits Ostend on official occasions. 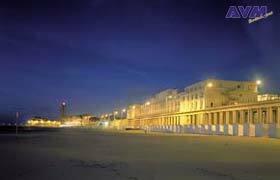 Ostend is the only Belgian coastal resort that is as lively in the summer as in the winter. Culture, sport or gastronomy: in short, theres a huge variety of things to choose from. In addition to the Kappellestraat, Adolf Buylstraat, Witte Nonnestraat (which are all traffic-free) there is the Alfons Pieterslaan and the Torhoutsesteenweg, where you can shop the whole year through. Every Thursday is market day in Ostend on the Wapenplein, Groentemarkt and Mijnplein..
Off-season, many of the shopping streets have their own special sales-days. 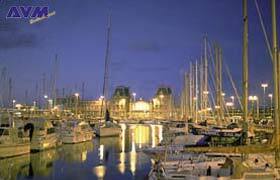 Ostend typically comes alive at night with its many bars, restaurants, etc. You will find several English pubs with organ music and live performers. Thousands of English tourists enjoy themselves in these pubs. 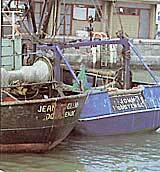 The English even call the city of Ostend the most British town in Europe. Traditionally , the first weekend of March is carnival weekend in Ostend. We have the Cimateire-parade (a float of coaches crossing the centre of the town accompanied by the inhabitants in costume). Theres the Kloeffeworp (clog-throwing), where thousands of clogs are thrown to the public on the main market-place; amongst them there is a clog of gold to be caught. In 1861 the club Cercle Coecilia started to organize a fancy-dress ball. Since then, people from all over Europe, and especially from Great-Britain, have come to this annual event, which provides the climax of the carnival. It is possible to take a tour around the city in a specially built mini-train or by horse-drawn carriage. The coach-drivers are very helpful in explaining the places of interest and sights. 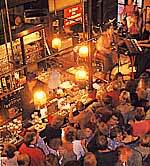 During the summer there is the annual jazz pub-tour. All the pubs participating in the tour have live music (jazz, blues, pop, rock, etc.) You can get from one pub to another on foot or by special coaches, horse-drawn carriages and trains and enjoy all sorts of different musical styles. Ostend is a very sport-oriented town by the sea. It has his own soccer team KVO and its own basketball team Telendus (ex-Sunair). Both of the teams do very well in national competitions. During Oostende beweegt the visitor can take part in all sorts of sports. Ostend has its own Olympic-size swimming pool. During the summer there is the opportunity to swim outdoors. Afterwards you can get a tan on the lawns next to the swimming pool, where beach-loungers are also available. You can practise your sailing, surfing or water-skiing on the North Sea. On the Spuikom it is possible to learn how to sail and surf. The annual fun-fair (de Foore) exceeds all expectations. The fair-grounds in Ostend are occupied by the fair-booths before they take their winter break and during October it is possible to visit fairgrounds on three market-squares. During the Christmas holidays you can ice-skate on the main market-place (Wapenplein). Would you like some Glühwein (hot mulled wine)? Or how about shopping at the many stalls surrounding the ice-rink? On New Years Eve, Ostend becomes a real party-town. Most of the restaurants serve special menus, various pubs organize special events to create a unique atmosphere on the last night of the year. 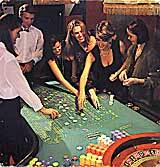 Every year thousands of revellers celebrate New Year in the Ostends Casino, where the New Years Eve Gala takes place.